The HSF1 EIA kit is a complete kit for the quantitative determination of HSF1 phosphorylated at Ser326 in cell lysates and tissue extracts from human and mouse origins. 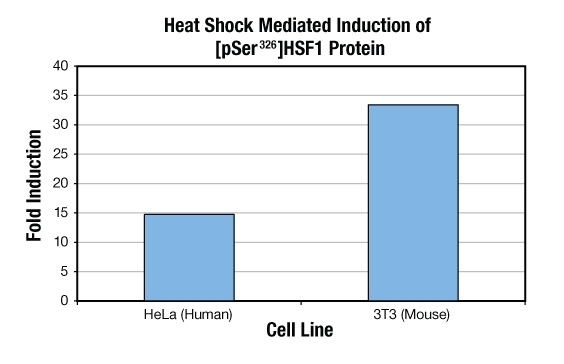 HeLa and 3T3 cells were grown to approximately 80% confluency and subjected to heat shock at 42°C for 2 hours. Extracts were prepared as described in the manual and the levels of HSF1 were determined in the assay. Induction is expressed as the fold change relative to non heat-shocked control samples. Application Notes: For the quantitative determination of human and mouse [pSer326]HSF1 in cell lysates and tissue.